Now that the US has voted to grant a second term to its president, Barack Obama, and the Chinese ruling party has selected Xi Jinping as its new leader and future president, one big layer of uncertainty has faded from the international scene. Uncertainty, however, still prevails in Europe, and the US Congress is still busy trying to reach a bipartisan agreement before the end of the year to avoid the risk of plunging over a fiscal cliff of funding cuts, long-term revenue losses and a stymied recovery. 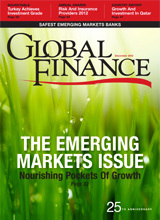 Much of this issue is devoted to reviewing the emerging markets, by region. We also present our annual ranking of the safest banks in those markets. In the midst of a clear slowdown—and in many cases a recession—in the most advanced economies of the West and of Japan, the emerging markets are dealing with several concurrent issues. Initially, they contributed to global growth and seemed to be only minimally affected by developments in the West. More recently, the decrease in global demand and trade has begun to impede previously robust emerging markets and to create uncertainty over their long-term performance. However, the slowdown has been more pronounced in some regions and countries than in others, and we still see stellar performances in certain countries. Can this growth continue despite the global scenario? Ideally, we might envision a transition toward a different regional balance and more trade between emerging markets, as well as toward more consumer-oriented rather than export-driven economies. We evaluate whether this is occurring in our annual Emerging Markets Review. We also present a new and expanded ranking of the best risk management providers. We use a highly rigorous methodology for choosing the best in each single-product category and geographical region, incorporating input from corporate risk managers and a poll of our readers. 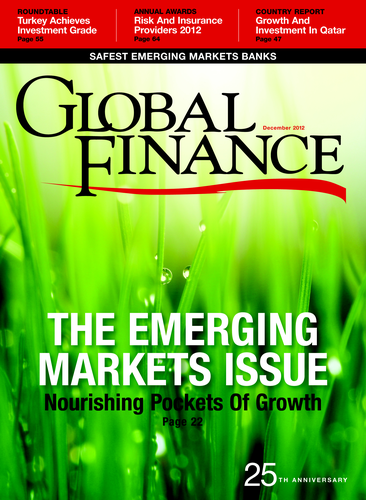 This is part of an ongoing process we are undertaking at Global Finance to ensure that our awards represent the views of our readers and to enhance their value.